Within the paraxial approximation, a closed-form solution for the Wigner phase-space distribution function is derived for diffuse reflection and small-angle scattering in a random medium. This solution is based on the extended Huygens–Fresnel principle for the optical field, which is widely used in studies of wave propagation through random media. The results are general in that they apply to both an arbitrary small-angle volume scattering function, and arbitrary (real) ABCD optical systems. Furthermore, they are valid in both the single- and multiple-scattering regimes. Some general features of the Wigner phase-space distribution function are discussed, and analytic results are obtained for various types of scattering functions in the asymptotic limit s≫1, where s is the optical depth. 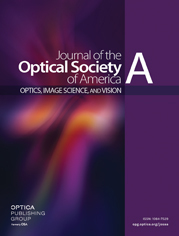 In particular, explicit results are presented for optical coherence tomography (OCT) systems. On this basis, a novel way of creating OCT images based on measurements of the momentum width of the Wigner phase-space distribution is suggested, and the advantage over conventional OCT images is discussed. Because all previous published studies regarding the Wigner function are carried out in the transmission geometry, it is important to note that the extended Huygens–Fresnel principle and the ABCD matrix formalism may be used successfully to describe this geometry (within the paraxial approximation). Therefore for completeness we present in an appendix the general closed-form solution for the Wigner phase-space distribution function in ABCD paraxial optical systems for direct propagation through random media, and in a second appendix absorption effects are included.